We spent two years in Singapore and Malaya while my dad helped to fight the C.T.s (‘communist terrorists’) under Chin Peng and Pau Lung. At the start of 1956, we Andersons lived in Port Dixon, Malaya, in a house called Narval-Ardi on the 3½ Milestone. Many of the army wives were scattered all over Malaya – some right up in Penang, living in a big hotel which had been converted into flats. Quite a number of them were down in Singapore, and before long, Jock decided that for the safety and morale of the wives, they should all be concentrated down in Singapore. At that point, we moved there with Daph and lived in Selarang Barracks in Changi. And for the two years that we were out there, Jock fought in the jungle. There weren’t many C.T.s left at that time, so trying to find them was a bit like looking for a needle in a haystack. Jock trained his soldiers hard and they became very fine troops. He told us tales of how they could stay in the jungle for much longer periods than any of the European troops out there, mainly because they could take the heat. They were trained to exist on low rations, carrying heavy packs, and often enduring three-week operations on two weeks’ worth of rations. And they’d do it if they had to, they’d eke out their rations as they sought out the C.T.s. They were a strange bunch: Jock even had one independent Gurkha battalion called the First Federation Brigade which was formed by the Malayan High Command largely out of surrendered communist terrorists! And that was the way the British Army and all of my dad’s soldiers operated in Malaya, even if it meant one single corporal patrolling out there on his own. As long as the jungle was continually patrolled, they could continually pick up signs of information, signs of where camps had been, how long it’d been since the C.T.s were in that camp and all that sort of thing. Perhaps one of the most extraordinary things about that war was that everything had to be recorded. The record keeping was impeccable for a war. After two challenging years in Singapore and Malaya, we returned to Salisbury at the end of 1957 when Jock was promoted to full colonel, and we moved into Number 91, North Avenue, opposite what was then Government House and is now President Mugabe’s offices. 91, North Avenue was a beautiful timber house, with a veranda stretching all the way around. It was one of those houses which had been introduced into Rhodesia in the 1920s: they were prefabricated, assembled and then bolted together, and they stood on stilts. The corrugated iron outside of ours was green and inside was mahogany, with wooden balustrades, white painted sides, and a red corrugated roof. There was a great grove of bamboo outside with a big musassa tree at the back and two musassa trees in the front, where my mother grew wonderful lilies. There was a vegetable garden on the right hand side, and two kias down at the back for the domestics. And this is where we all lived. Mum, Dad, me, Colin, John – and Joseph Mbulawa. And we did. It was a huge house with the most stunning walled garden. Jock had all the detritus cut back so that the plants which grew there were truly fantastic and the air was full of humming birds. One day, just after we’d moved into this vast house, my dad decided to drive round the surrounding farms to see if he could get some meat. There were no stores in the barracks, just a canteen – the ‘NAAFI’ – where you could buy milk and eggs. But Jock fancied a drive and he wanted to see if some farmer somewhere had some beef to sell. So he set off down a track towards the nearest farm. It was possible at that time in Rhodesia to drive along mile upon mile of dirt track, until you suddenly came upon a gate with a barbed wire fence and a cattle grid. And you’d open the gate and drive your car through and close the gate behind you and then drive on. On this particular afternoon, just as my father comes up to one of these gates, he sees a black man riding on a bicycle, immaculate. He’s wearing a brown fedora hat, a white linen jacket, a white shirt with a tie, grey flannels with bicycle clips, and he’s riding an immaculate bicycle along the side of the road. As Jock reaches the gate, the man climbs off his bicycle, opens the gate, stands there with the gate open, and then doffs his hat to my father. As Jock drives through the gate, the man closes it behind him, gets back on his bike and rides off. Jock is immensely impressed by the fact that here, in the middle of the bush, there’s this immaculate man with immaculate manners opening the gate with style. ‘Well, I’m not sure we’re looking for anyone,’ says Jock. 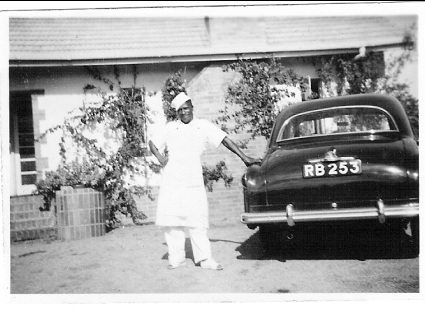 After all, as well as Winston the batman, we already had a cook called Andrew Banda (whom my mum had persuaded to come down from Lusaka, where we’d lived for those six months in 1954), and a boy working in the garden. ‘We already have a cook and a garden boy,’ says my father. ‘But I have come to work for you,’ insists the immaculate man. Jock thinks for a moment. And without a moment’s thought, Joseph Mbulawa says that he would like the job very much. ‘Would you mind wearing a kanza?’ asks Jock, referring to the formal dress worn in Lusaka. And Joseph says that he would like that very much. Straight away, my father issued Joseph Mbulawa with two pairs of white plimsolls, a white tunic with a mandarin collar, white trousers, a bright green cumberband, and a white serving cap which was flat on top like a squashed fez and adorned with the silver military shield of the Rhodesian African Rifles. (Joseph immediately removed the white plimsolls because he didn’t really like them.) And thus he became the major domo. And we’d all get up and get dressed. With Joseph Mbulawa in tow, we’d fly into the car with our guns and our bags and we’d drive out to the training camp at Nkomo, where at six o’clock as the sun came up a few others would be waiting for us. Then we’d all pack into the Landrover and we’d plough through the bhundu, shouting, ‘Buck! Right!’ and banging on our seats. Jock would take out his rifle and aim at the buck and he’d kill the beast with a single shot. We’d rush to the animal and Joseph would take out his knife and he’d stick it into the buck’s throat to drain the blood. Then we’d chuck the buck in the back of the Landrover and off we’d set again. ‘Guinea fowl! Left!’ we’d shout with glee and, slinging our shotguns over our shoulders, we’d charge through the bush and we’d blast the hell out of the guinea fowl. Once we’d taken out six or seven birds, we’d walk back through the bhundu, and haul the carcasses into the Landrover, and off we’d set again. In the meantime, my mother would have driven by car and set up camp at the dam. We’d pitch up at nine o’clock and we’d all sit around – Joseph Mbulawa, Jock Anderson, us three boys, and maybe five or six others – and my mum would cook us all breakfast. And she would serve breakfast to Joseph. Of course, he revelled in the fact that he was being served by a white woman, as this was really the only opportunity that Daph had to do it. (It would have been totally inappropriate at any other time.) But, here in the middle of the bush on a Sunday morning, Daph would be serving food to a black man – much to everybody’s delight. And he would stand by the door, whistling, ‘Oh my darling Clementine’. A servant could never normally behave like this, so it was curious to see just how their relationship developed. And if ever my mother said, ‘But, Joseph, I’m your employer,’ he would simply reply, ‘Then sack me if you want…’ But of course she never did. ‘Yeah, yeah, yeah!’ we all laughed, as our vast steam train pulled away and Joseph pedalled off on his bicycle. We travelled through the night and spent the first day in Salisbury, where my father was taken out to lunch with the mayor and a big parade was held in the regiment’s honour. At eight o’clock that evening, we all clambered back onto the train. It was a vast, old-fashioned choo-choo train, with about a thousand people aboard, including the whole regiment of eight hundred soldiers. There were thirty or forty trucks, with ‘A’ Company in one section, and ‘B’ Company in another, and ‘C’ Company in a third. It was a hugely, exhilarating thing to be part of: the railway and the regiment and the regalia. Once again my dad took it into his head to organise something special. He arranged for the Second-in-Command – a man called Frank Fitzgerald and his family – to travel with our family in one whole wagon which Jock had asked to be detached from the guard’s van at the back of the train and hitched to the very rear. At the end of the wagon was a little open-air platform like a veranda, and Jock had decided he was going to have a nightcap with my mother sitting on this veranda looking out over moonlit Africa. At ten o’clock the next morning, we arrived in Mozambique. The train in Beira goes right up to the harbour. We disembarked and crossed the tracks, and the whole regiment walked in file up the gang plank onto the boat, with one suitcase each and their packs on their backs. They were all in jungle green, eight hundred black soldiers. Very smart. Very impressive. Very handsome. We boarded the boat, and at eight o’clock that evening we were ready to set sail. Just as we were waving goodbye to those ashore, who should appear, but Joseph Mbulawa! He’d been in Beira all day! As we’d been journeying by train from Bulawayo, he’d travelled by bus all the way to Umtali, where he changed bus and caught another one to Beira. And yes indeed, he’d arrived there before us! As he waved us off to Malaya, he shouted, ‘I will see you when you get back!’ And sure enough, when we arrived in Bulawayo two years later, there was Joseph Mbulawa waiting for us. And for the next six years, he continued to devote his life to us. In 1984, Daph and Jock went back to Zimbabwe, and they travelled down to Bulawayo to look for him. They discovered that he’d ended up as a cook in the Officers’ Mess at a place called Brady Barracks. 1982 had seen the events of ‘Gukuruhundi’, which is a Shona expression meaning, ‘The rain that blows away the chaff’. It was a word used by Robert Mugabe to describe the ‘cleansing’ of Matabeleland ‘dissidents’, during which 30,000 Matabele were killed. It seemed that Joseph Mbulawa must have been one of the victims of the purge, because in spite of Daph’s efforts to trace him, nobody wanted to speak about his disappearance. It was all very odd. There were no records, like my father had kept in the Malayan jungle war. Everything was a mystery. Joseph’s son Silvo had joined the army, which meant that he was either dead by now or in South Africa. Who knows? But Joseph Mbulawa was definitely killed. He wasn’t a man who would have died prematurely of natural causes.